M-CERSI includes the College Park and Baltimore campuses of the University of Maryland. The Baltimore campus is focused on health, law, and human services. Six professional schools and a Graduate School confer the majority of health care professional degrees in Maryland each year. The College Park campus is a preeminent public research university, and a global leader in research, entrepreneurship and innovation, with more than 37,000 students and 9,000 faculty and staff. Maryland is highly recognized for undergraduate entrepreneurship programs. The University of Maryland and its health care facilities have significant research capabilities that concern the development and evaluation of FDA-regulated products (e.g. human and animal drugs, biologics, devices, and vaccines). Example capabilities are below. The Maryland GMP Facility manufactures non-sterile clinical trial materials. The focus of the lab is on both process as well as system level manufacturing solutions. The current research activities include manufacturing process and system simulation, process planning, production planning, manufacturability analysis, and nanomaterial processing. Current facilities include injection molding, CNC machining, ceramic gel casting, in-mold assembly, laser cutting/etching, layered manufacturing, power processing, high temperature sintering, and resin transfer molding. Read more. ICTR (ik-ter) facilitates clinical translational research initiatives. ICTR provides financial support as well as infrastructure, environment, training, and work force to invigorate, facilitate, and accelerate clinical translational research to improve patient and community health. Read more. This program houses two comprehensive bioprocessing R&D facilities and a GMP training facility. One is in IBBR NIST at Shady Grove the other is in College Park. The Center houses several core facilities, one focus is on the science of safe food, drugs, and devices. The Center includes a complete micro and nano fabrication lab (FabLab), a nanoscale imaging spectroscopy and properties lab (NISP), and a NanoOptics lab. Read more. 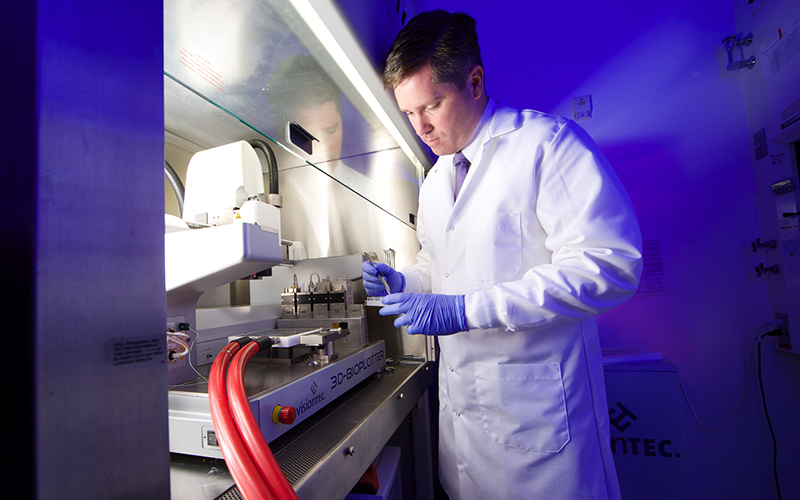 This Center provides access to cutting-edge technologies in mass spectrometry, including GLP-bioanalysis. Read more. There are several suites for characterization of protein and small molecule pharmaceuticals and other biologics. One is in IBBR Shady Grove, joint with NIST, the other is in College Park. Facilities are available up to 950 MHz. Read more. This Center develops and tests numerous vaccines. Read more. A large number of Baltimore-based basic, clinical, and translational biomedical research resources (e.g. drug development, imaging, bioinformatics, animal, genomic) are listed here. Read more. This Center provides high throughput DNA sequencing and RNAseq technologies supported by Illumina technology. The Center also has a proteomics core and a mass spectrometry core. Read more about the University of Maryland Institute for Bioscience and Biotechnology Resource (IBBR) Sequencing Core. Read more about the UMD Department of Chemistry & Biochemistry Mass Spectrometry facility. Read more about UMD's College of Computer, Mathematical & Natural Sciences' Proteomics Core facility. This Center supports the full spectrum of patient-oriented research. Read more. MNC houses a research-dedicated Magnetic Resonance Imaging (MRI) scanner, ideal for mapping brain structures and the location of brain activity. A special focus of the center is on understanding mechanisms of brain development and neural plasticity in typical and atypical populations, and in understanding the neural mechanisms underlying expert abilities that serve critical national priorities. The centerpiece is a Siemens 3 Tesla TIM TRIO scanner. Read more. This Center provides computational programming and data management support for health services research. Read more. This Center focuses on improving access to and outcomes of pharmaceutical care for elderly patients. Read more. The Mission of the Maryland Center for Health Equity is to: (i) Establish and sustain a community engaged research enterprise on critical health disparities; (ii) Raise the visibility of racial and ethnic health disparities and promising solutions with Marylanders and (iii) Facilitate action for change in the structural determinants of health in Maryland. The lab/center has a long, rich history of transforming the experience people have with new technologies. From understanding user needs to developing and evaluating technologies, the HCIL develops advanced user interfaces and design methodology. Read more. Terrapin Works is a collection of digital manufacturing resources provided as a service to the campus and surrounding community. These resources range from consumer grade 3D printers to high end production systems capable of creating complex parts in a variety of materials. Terrapin Works offers production & design services as well as access to equipment in our multitude of locations across campus. Read more. The Center works with client organizations on the following: Verification and validation; Modeling, design and architecture; Process and product measurement; Reliability, safety and security analysis; Process improvement, best practices and training; Technology evaluation; Program, project and risk management. Read more. The Center for Advanced Life Cycle Engineering (CALCE) is recognized as a founder and driving force behind the development and implementation of physics-of-failure (PoF) approaches to reliability, as well as a world leader in accelerated testing, electronic parts selection and management, and supply-chain management. Read more. The Center strives to decrease the cost and complexity of poisoning and overdose care while maintaining and improving patient outcomes. The Center receives approximately 57,000 calls per year. Read more. Read more about the Maryland Center for Health Equity (M-CHE). The International Food Safety Training Laboratory (IFSTL) is a 4,600 square feet laboratory facility located at the University of Maryland. It is the home of JIFSAN's latest program focusing on laboratory capacity building to ensure the safety of the US food supply and harmonization of analytical methods worldwide. IFSTL was created in partnership with the Waters Corporation and is dedicated to training in the area of chemical and microbial food safety. Read more.